Aspen was an angel with gossamer wings. She wore a lacy, pale pink dress with golden sparkles all over it, had short brown hair with golden highlights, and a small golden halo floated in the air just above her head. Aspen was the guardian of a glen in the heart of Scotland. The glen had a shallow stream flowing through it, tall waving grasses, and was thickly carpeted with wild flowers of every color imaginable. One of her much loved duties as guardian angel of the glen was to watch over and help care for all the baby animals that lived there. She also tended to the flowers, bees, mice, and butterflies. Aspen loved being in the glen. If a baby bird fell out of its nest, she’d quickly fly over, catch it and carry it back up to its nest. She’d lay it softly under the wings of its mother. Now and then she’d take a fawn down to the stream for a drink while its mother rested. Aspen helped the flowers shake off the morning dew, but only after she was sure that the butterflies had sipped what they needed for the day. The baby mice would sometimes wander off and she’d be there to help find them. Once she found one near the stream, almost ready to fall in. She’d picked it up by its tail and flew it home to its unhappy mother. All of the animals, flowers, and insects loved Aspen. At nights she slept inside a bright red tulip, always having an ear open for anything in need. One day the sky was a silvery gray color. Aspen was concerned. She knew this meant a storm was coming. Quickly she flew around the glen, making sure all of the baby animals were accounted for and that all the flowers had closed up tightly. When she was sure everything was all right, she flew into her tulip and shut herself inside. Soon the wind began to blow. The flowers bent nearly to the ground. Aspen could hear the wee animals crying in fear. She heard the leaves on the trees shaking in the wind’s fury. The stream began to flow faster as huge raindrops splattered on the side of the tulip’s petals. After the storm had passed, Aspen left the safety of the tulip. 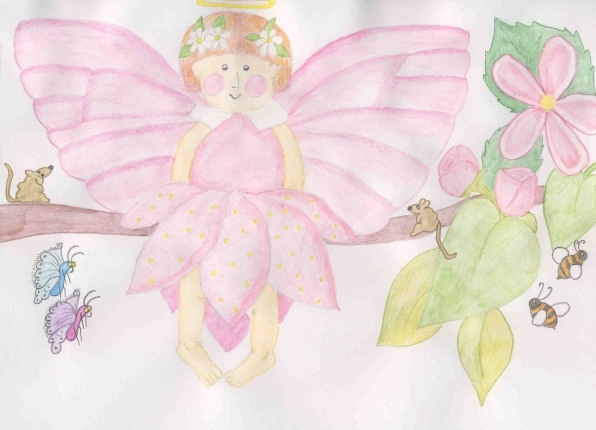 She straightened out her gossamer wings and wiped the raindrops from her pink dress. She flew high up into the air so she could see the whole meadow at once. The deer were all right. They’d found a pine tree to huddle under. The birds were all in their nests with their babies next to them. The butterflies came out and flew around the flowers, which were all standing up straight and tall again. Everything seemed to be fine. Then she spotted Mother mouse. She was running around frantically. Aspen flew over to her. Mother mouse told her that one of her babies was missing. He had wandered out before the storm and had never come home. Aspen knew exactly which baby it was too; the one she’d saved from falling into the stream a few days before. Aspen gasped. The stream was flowing much quicker because of the rain. She told Mother mouse to keep looking and flew off towards the stream. She looked in the water and was horrified to see the baby mouse, sitting in the middle of a huge red maple leaf that was floating down the fast moving stream. He was squealing and running back and forth on the leaf, which floated right past Aspen. She could see the terror in the wee mouse’s eyes. She flew into the air and chased the leaf. She got close enough to grab the wee mouse by the tail, just as the leaf hit a rock. She held onto him and dropped him into the grass. The wee mouse hugged Aspen tightly and cried. Aspen picked him up and flew him back to Mother mouse, who was happy to see her baby. Just then a beautiful rainbow appeared in the sky. All the animals in the glen came out to see it. Aspen looked at them all and felt very happy. Everyone was safe once more. She was glad that she was guardian angel of this glen!